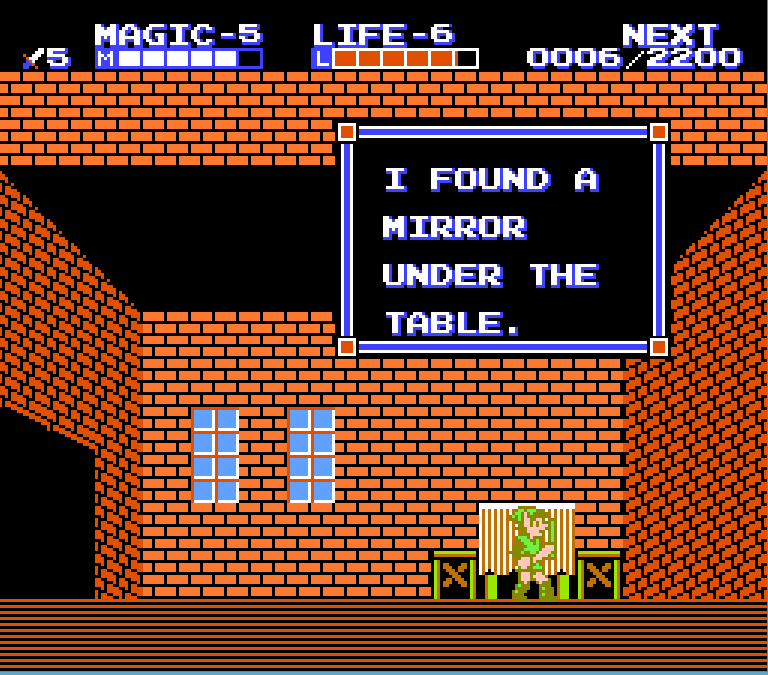 Is this line from Zelda 2 the only time Link's thoughts are verbalized? As far as I can tell, this is the first and only time that Link's thoughts are verbalized directly to the player. As most everyone knows, Link is a silent hero who only grunts and yells. Obviously moreso in the later games. The games even make fun of that occasionally by having characters ask him why he's so quiet or whatever. Link has no written or spoken dialogue of note in any game, with the exception of two instances in Zelda II: The Adventure of Link. (Source) This doesn't mean that Link is a mute, per se (he can interact in conversations, after all), rather, Link's lack of dialogue is simply a design choice from Nintendo. Not the answer you're looking for? Browse other questions tagged legend-of-zelda-series or ask your own question. Are there humans in Zelda? Which Zelda and Link are featured in the Super Smash Bros. series? How are the pieces of the Triforce distributed? What other heroes are from the Hylian race? Which Legend of Zelda game does this Link with the white cap belong to? What are the origins of the Master Sword? Who can recognize this piece of Zelda music?